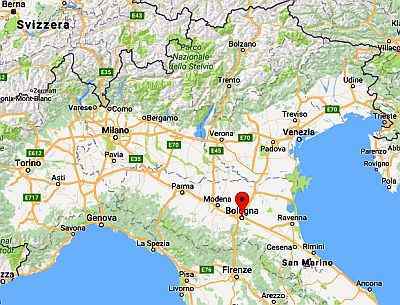 In Bologna, the capital of the Emilia-Romagna region, and located in the Po Valley, there is a humid temperate climate. Winters are quite cold and damp, while summers are hot and muggy. The monthly average temperature ranges from 3 °C (37.5 °F) in January to 24.5 °C (76 °F) in July. Precipitation is moderate, since it amounts to 670 millimeters (26.4 inches) per year; the rains are fairly well distributed throughout the year, even though there are two peaks in spring and autumn, and two relative minima in winter and summer. Summer is the season in which the rains are less frequent; in this season, and in late spring, they may occur in the form of thunderstorm. Winter, from December to February, is cold, wet and dull. Temperatures can remain around 0 °C (32 °F) even during the day, and the sky remains overcast for many days. Fog, which in the past was fairly frequent, has become rarer in recent decades, and lately occurs only during periods when the Atlantic high pressure dominates. Wind is generally weak or absent, although sometimes the southwest mild wind that descends from the Apennines and comes from central Italy can blow, while at other times the north-east cold wind blows. There is a moderate amount of rainy days, although winter is the relatively driest season. Snow generally falls at least once every year, and sometimes can be abundant; during the heaviest snowfalls, usually snow depth reaches 25-30 centimeters (10/12 inches), but in January 1985 it reached 75 cm (30 in), and in February 2012 it reached 95 cm (37 in). 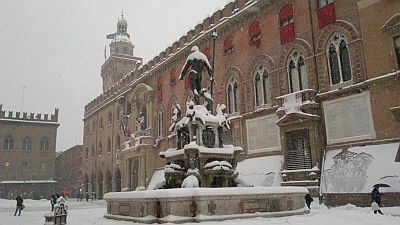 Snow in Bologna occurs during cold spells, when the Bora, the cold wind from Eastern Europe, which is initially dry, acquires moisture on the Adriatic Sea and then it's forced to rise when it meets the Apennines. Fortunately, in the old town you can walk comfortably under the arcades, protected from rain or snow. During the most intense cold spells, nighttime lows can drop to around -10/-15 °C (5/14 °F). Typically, in the second half of February the temperature tends to rise, and highs can quite easily exceed 10/12 °C (50/54 °F). Spring in Bologna is initially unstable, and gradually becomes a pleasant season, especially from mid-April to late May, when there are many sunny days, with mild or pleasantly warm temperatures during the day. In March, however, the first mild days alternate with the return of cold weather; also in April it can be cold, especially in the first half of the month. Atlantic depressions able to bring rainfall are quite frequent. As of May, the first heat thunderstorms may occur. Summer, from June to August, is hot and muggy, and generally sunny. The air feels hotter because of humidity and poor ventilation, conditions typical of the Po Valley; it is true that we are close to Romagna, which receives a bit of breeze from the sea, but it is also true that within the city the heat is trapped between buildings. In hot periods, the temperature quite easily reaches 34/35 °C (93/95 °F), and sometimes up to 37/38 °C (99/100 °F). On summer evenings, strictly after sunset, in the city center, locals spend time outdoors to get some air. However, the city is located close to the hills, and in the southern suburbs you can find, in the evening and at night, a temperature a few degrees lower and a bit of breeze from the mountains. Sometimes, even in summer, Atlantic disturbances, able to bring a bit of rain and cool weather, can affect this area, especially in June and late August; or thunderstorms can break out in the afternoon or in the evening, but for long periods the sun shines and the temperature is high. Autumn offers fine days in September, and sometimes in early October, then quickly becomes gray and rainy enough. The first cold days usually occur in November. On the whole, autumn is the rainiest season of the year. The amount of sunshine in Bologna is low from mid-October to February, when the sun is rarely seen, and even when it comes out, it is often weak and veiled in mist (though it goes a bit better than in Milan and in the western Po Valley). However, sunshine is quite frequent in spring, and it is very frequent in summer, except in the rare rainy days or when sunny days are interrupted by afternoon thunderstorms. 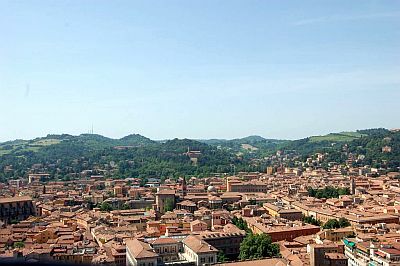 The best times to visit Bologna are spring and early summer, especially from mid-April to mid-June. September, too, is a good month. However, you have to take into account some rainy days in both periods. Summer, on the contrary, can be hot, although it may bring also some acceptable days, especially in June. You must take into account, in the summer and sometimes in May, some thunderstorms in the afternoon or in the evening. In summer, you can reach the sea by car, on the Adriatic Riviera, if there is not too much traffic, in an hour or a little more.